There is a big difference between analyzing a stock versus analyzing a company. Sentiment analysis tells you what other investors are doing and whether or not you are likely to have more buyers or sellers. Technical analysis can reveal patterns in the stock and can tell if there are significant support or resistance levels on the horizon. By using fundamental, technical, and sentiment analysis, I believe you arrive at what the whole picture looks like for the stock. I try to write at least two articles per week for Seeking Alpha and the vast majority of my articles focus on upcoming earnings reports. My articles include fundamental analysis, sentiment analysis, and technical analysis, and I believe you have to look at all three analysis styles. The fundamentals tell you how the company is doing, the sentiment tells you what other investors are doing, and the technical analysis tells you what the stock is doing. The fundamentals and the technicals don’t always agree with one another, and I think that is due to the sentiment. To me, the difference between analyzing a company versus analyzing a stock boils down to looking at the sentiment and the chart. Doing deep fundamental analysis is analyzing the company. There are numerous analysts and writers that are better than me at digging deep in to a company’s financials. I am not a forensic accountant and in fact I hated my accounting classes in college. What is interesting is when I get feedback from readers that my article had too much technical analysis or didn’t go in to the fundamentals far enough. Of course there are the readers who weigh in with the “you’re an idiot” comments because I wrote a bearish piece about a stock they own. In fact, there has been a discussion on the contributor discussion board about how writers are treated when they write bearish pieces. Personally I would rather read an unbiased article than read one from someone that is already invested in the stock and has reasons to want the stock to move in one direction or the other. That is just a personal preference. I have written about Adobe (ADBE) on several occasions now. The most recent article was on March 12 when I was cautious ahead of the earnings report. My cautious stance had nothing to do with the company. In fact, I just sent a list of some of my favorite stocks to members of The Hedged Alpha Strategy and Adobe was on the list, even though it isn’t in the portfolio - at least not yet. The reason for my caution was based on the overbought status of the stock, a shift in the sentiment toward a more bullish stance, and a pattern where the stock dropped after each earnings report. When Adobe announced earnings on March 14, the stock dropped lower the next day, just like it did in December and September and in numerous other instances after earnings. If I only looked at the fundamentals, I would not have known about the pattern of the stock dropping after earnings. By looking at the chart and the sentiment, I suggested to readers that they wait until after the earnings report to buy the stock - if they were looking to buy. I will give you another example of why technical analysis matters. 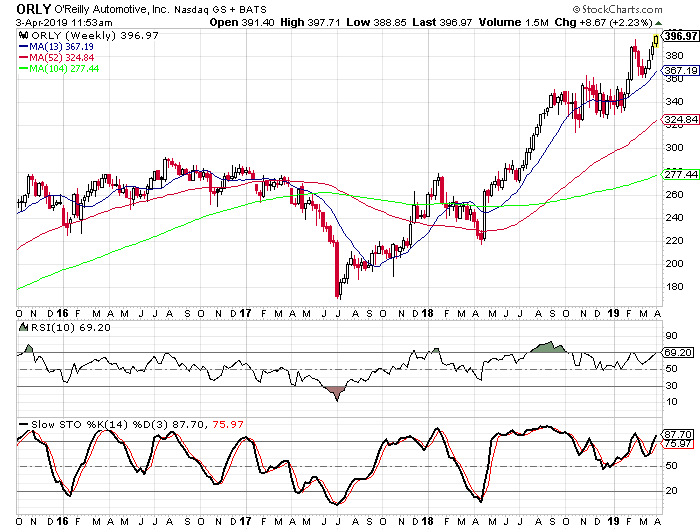 O’Reilly Automotive (ORLY) and LKQ Corp. (LKQ) are both in the auto parts industry. Looking at the EPS ratings and SMR ratings from Investor’s Business Daily, both companies appear to doing relatively well. O’Reilly has an EPS rating of 95 and an SMR rating of an A while LKQ has an EPS rating of an 88 and an SMR rating of an A. These ratings are something that I use as a quick snapshot of how a company is doing. Depending upon what I see from them, I may decide to look closer at the numbers used to form these ratings. If I decide to write about the company I look at the charts and the sentiment to see what the rest of the story looks like. In the case of O’Reilly and LKQ, the charts show two very different situations. O’Reilly’s chart shows a stock that has been moving higher for the past year, jumping from the $220 area to almost $400 now. The stock is above all of its long-term moving averages, but it is overbought. On the other hand, LKQ has fallen from the $39 area to a low around $23 and has bounced back to the $30 area. But LKQ is below its 52-week and 104-week moving averages. It is also overbought from the rally off the December low. Given the choice between these two stocks, I would obviously choose O’Reilly. I would love to see it pullback a little to move out of overbought territory, but it would have potential support at the 52-week moving average and the $340 area where it consolidated in the fourth quarter. LKQ is facing resistance at this time from its 52-week moving average and the $30 area was support in the second quarter of last year. It could now be acting as resistance. These are two companies from the same industry with similar earnings growth, similar sales growth, and both with good management efficiency measurements, but very different technical scenarios. Just based on the fundamentals and the charts, which one of these stocks do you think I would choose? Before making a decision between the two companies, I would look at the sentiment toward each stock of course. Right now, O’Reilly has 24 analysts following it and 12 have the stock rated as a “buy,” 11 have it rated as a “hold,” and one has it rated as a “sell.” LKQ has 16 analysts following it with 15 “buy” ratings and only one “hold” rating. Looking at the short interest ratios for each one, O’Reilly’s is at 2.04 and it has increased in the last month. LKQ’s short interest ratio is at 3.01 and it has fallen over the last month. From a contrarian perspective, skepticism is increasing on O’Reilly and that is more attractive. The sentiment toward LKQ is growing more optimistic and that is a concern. There is room for analyst upgrades on O’Reilly, but not much room on LKQ. Short sellers are becoming more pessimistic toward O’Reilly and more optimistic on LKQ. Looking at the overall picture of O’Reilly and LKQ, I would choose O’Reilly. The fundamentals are slightly better, but it is the technical picture and the sentiment that tips the scales for me. Both appear to have strong fundamentals, but fundamentals alone won’t make a stock go up. If you look at stocks in a very raw, basic economic form, there is only one reason that a stock goes up in price: There are more buyers than sellers. Yes, I know the argument that every transaction has a buyer and a seller. But every stock also has a bid price and an ask price. If the buyer pays up to make sure the order gets filled, the ask price will go up. And then the process starts over again. If the transactions are being driven by buyers the price goes up. For me the sentiment tells investors whether there are likely to be more buyers than sellers. The more pessimistic investors are, the more possible buying pressure there is. The more optimistic investors are, the more potential selling pressure there is. 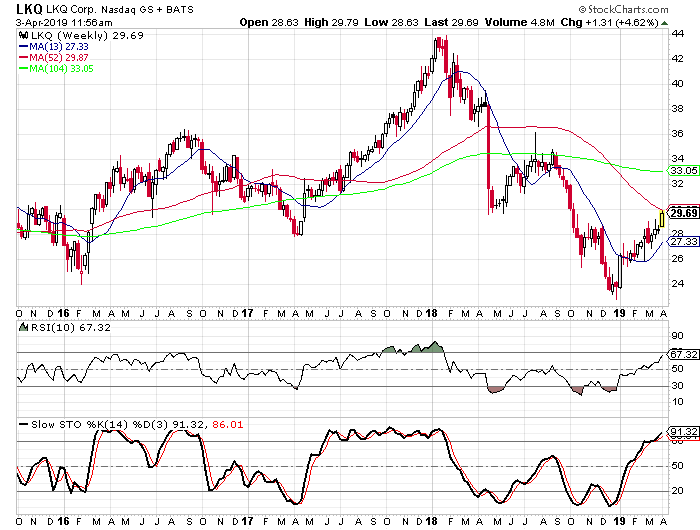 I look back at a cautious article I wrote about Micron Technology (MU) last June. I wasn’t bearish on the stock, but I was concerned about the amount of bullish sentiment there was toward the stock ahead of the earnings release. My cautious stance was questioned by a number of readers and the “this is garbage” remarks came in bunches. The comments all but cemented my argument that investors were expecting too much from the earnings report. That article was published on June 20 when the stock closed at $58.95. By July 3, it reached a low of $50.10 and it would go on to lose half of its value at the low in December. Here was a company with strong fundamentals and a great looking chart, but the sentiment was too bullish for my liking. I didn’t get it exactly right on Micron as I wrote a bullish article on July 10. But at least I wasn’t suggesting that investors buy the stock up near $60. There are many different ways to analyze a company and a stock. Like I said before there are many writers and analysts that are better than me when it comes to breaking down the fundamentals. What I do is analyze the stock: the fundamentals, the sentiment, and the chart. I don’t think my way is the only way or anything like that. In fact, I read fundamental articles quite often from other analysts because I know they are better at that than I am. But no matter how great the fundamentals are, I always look at the chart and the sentiment as well. This is the approach I have taken for a number of years now and I have found that it works for me. It doesn’t work for me every time, but it works for me more times than not.